Your feet take a lot of damage on a daily basis, and not taking care of them increases your risk for a wide variety of different foot injuries. 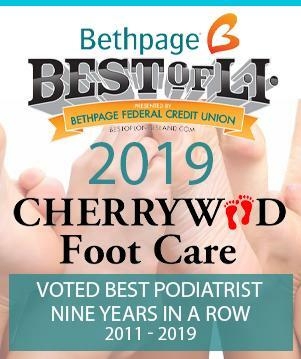 Here at Cherrywood Foot Care, our podiatrist near East Meadow, Merrick, and Bellmore can provide a variety of different treatments that will help protect your feet. using specific inserts that take pressure off your big toe. Morton’s Neuroma – Morton’s Neuroma occurs when a person wears shoes that have a tapered toe box or when they wear high-heeled shoes that force the toes into a tight box. These types of shoes will cause your nerve tissue to become thick and irritated in the ball of your foot. Along with irritation, you may feel a clicking in the bones of your feet. Using arch supports or foot pads can help take pressure off the irritated nerve. Our podiatrist near East Meadow can make you a custom arch support that molds to the contours of your foot. Plantar fasciitis – Plantar fasciitis is common among both men and women. This condition will usually result from wearing flats or sandals for too long. Furthermore, plantar fasciitis occurs when the arch of your foot becomes flattened due to a lack of arch support in your shoes. One potential treatment option for plantar fasciitis includes using anti-inflammatory medications or steroid injections to reduce inflammation. splints to protect and support your feet. Choosing the right shoe now can save you from a lot of pain in the future. Thankfully, if you are experiencing any of these foot conditions and injuries, be sure to contact our podiatrist near East Meadow today!